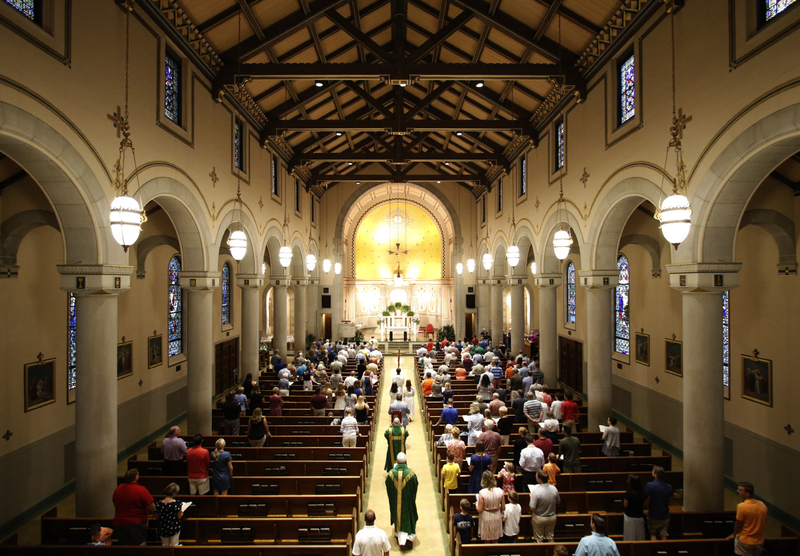 Blessed Sacrament Parish is a community of 1800 families located in the heart of Ft. Mitchell, KY. Many of our families have been parishioners for generations and have a deep love for the parish and surrounding community. In 1885, Bishop Maes transferred Reverend Bernard Hillebrand from St. Boniface Parish, Ludlow to St. John Orphanage to serve as chaplain, and to organize the Catholics living in the neighborhood of the orphanage into a congregation. The congregation became known as St. John Congregation, Kenton County. Divine services were held at the orphanage chapel, and a school was opened. Father Hillebrand cared for the St. John Congregation for about twenty-three years, 1885-1908. When his health became undermined in 1908, he was forced to retire from his pastoral charges, taking up residence at Villa Madonna. Bishop Maes had granted permission for the establishing of a new parish in April 1908, but during his episcopate no definite steps had been taken to erect a parish church. In the early part of the episcopate of Bishop Brossart, the congregation undertook to establish a parish plant. On December 26, 1916, Reverend William Blees was appointed chaplain of the St. John Orphanage, and pastor of the St. John Congregation, Kenton County. Father Blees organized and became the first pastor of Blessed Sacrament Parish, South Fort Mitchell. On March 16, 1917, a piece of property consisting of about three acres was acquired in Fort Mitchell, fronting on the Lexington Pike. In the latter part of January 1920, Bishop Brossart gave permission for the erection of a church, in accordance with the plans which had been submitted to the Diocesan Building Committee. The first church building, erected in 1920, was a combination church and school. A meeting for the selecting of a committee to make arrangements for the laying of the cornerstone of the new church was held April 20, 1920, at Stevie's Hall on Dixie Highway. On April 15 of that year, the cornerstone of the new church was laid. The church was dedicated to Our Lord in the Blessed Sacrament, and the first Mass was offered in the church on December 26, 1920. In 1922, a priest's house was built, and in 1924 the school was enlarged. In 1928, the Sisters' convent was completed. In 1938, the erection of the present church was begun on parish property situated to the left of the rectory. The cornerstone was laid on Sunday, July 10, 1938 by Right Reverend Monsignor Ignatius M. Ahmann, V.G. A church, constructed of brick and stone, one hundred and sixty-three by seventy-six feet, with a tower surmounting the right transcept, was erected, having a seating capacity for about eight hundred and fifty persons. The new Blessed Sacrament Church was dedicated by Bishop Howard on September 24, 1939. The new church, Lombardy-Romanesque in architectural style, was replete with symbolic emblems centering around the Blessed Sacrament. It displayed truly medieval lines both on the exterior and the interior. Its beautiful art and architecture give glory to God and stand as a monument to the doctrine of the Real Presence of Christ in the Blessed Sacrament. Over the years the Blessed Sacrament campus has gone through many renovations to meet the needs of our growing Catholic faith community. Highlights include the following. Former convent building renovated to house parish offices and a small conference room. The building was renamed the Blees Center after our founding pastor. Renovation of church Undercroft, providing a beautiful location for large meetings, parish gatherings, receptions, etc.